After the Big Bang, the Universe began cooling, and atoms like hydrogen, helium, and lithium began forming out of the free particles. When the whole Universe reached a temperature of a few thousand degrees, these atoms should have begun bonding to one another (otherwise, we wouldn’t exist), and physics theory suggests that the very first bond would have been a helium atom bonded to a hydrogen atom. But the resulting helium hydride ion has never been found in space—until now, thanks to the Stratospheric Observatory for Infrared Astronomy, or SOFIA. the study’s first author, Rolf Güsten from the Max Planck Institute for Radioastronomy, told Gizmodo. Scientists first needed to verify that the Universe could create such a molecule at all. Researchers in the 1970s theorized that nearby plasmas in planetary nebulae, dying stars surrounded by expelled material, might contain helium hydride. But scientists have faced challenges discovering the molecule, calling into question whether the molecule exists in space at all, according to the paper published today in Nature. “Until very recently, there was no technology to do it,” Güsten explained. The signature wavelengths of light released by the molecule would be absorbed by the Earth’s atmosphere. Geoffrey Blake, a California Institute of Technology professor who was not involved in the study, told Gizmodo that scientists had stopped looking for the molecule in the early Universe—meaning the very distant Universe—because they hadn’t even managed to find it nearby. But now, NASA and the German Aerospace Center (DLR) have a customized Boeing 747, SOFIA, that was prepared to perform the search. SOFIA flies at 38,000 to 45,000 feet, according to a NASA fact sheet, which is above 99 percent of the infrared-absorbing parts of the atmosphere. 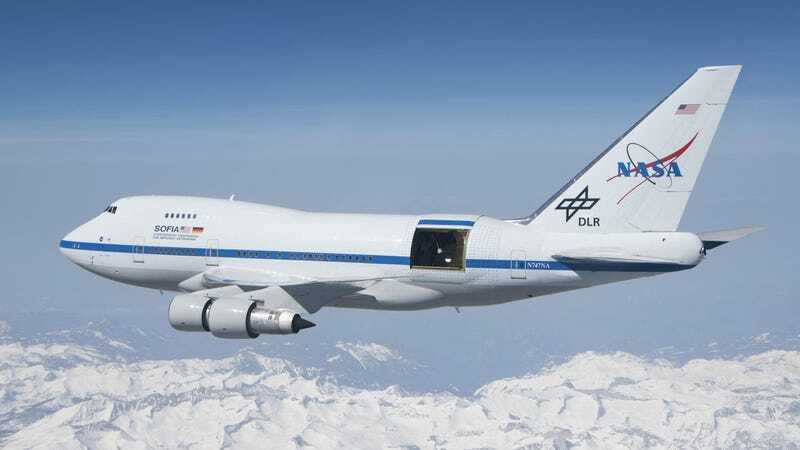 The researchers deployed an instrument onto SOFIA called the German Receiver for Astronomy at Terahertz Frequencies (GREAT), and pointed it toward the planetary nebula NGC 7027, well known for offering scientists a number of other astrochemistry discoveries. After three flights in May 2016 and some data analysis, the work revealed the presence of helium hydride molecules in the nebula. These results demonstrated to researchers that the Universe could indeed form the molecule on its own, and have improved astronomers’ understanding of the earliest eras after the Big Bang. It’s a big deal. “I would say this is probably the most important discovery made yet by the SOFIA observatory,” Mike Barlow, professor at the University College, London who was not involved with the research and who reviewed the paper, told Gizmodo. He found the data convincing. So no, they didn’t discover the exact earliest helium hydride, but now scientists can perhaps go back to hunting for the signature from farther sources, said Blake. And it’s nice to know that research into the origins of chemistry has been going down the right path. It’s even cooler that the research happens aboard one of the least conventional telescopes around.